Can the TollFree Protector Hide You from Red Light Cameras? 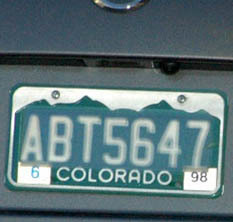 Red light camera photo of TollFree Protector-covered plate. Rating: "...ineffective against radar"
The Tollfree Protector is claimed to defeat red light cameras and also toll booth cameras, which typically operate at a much sharper angle than red light cameras. It works well against toll booth cameras: we were delayed each time we exited the Sky Harbor Airport parking lot as the ALPR (automatic license plate reader) struggled in vain to decipher the plate. It failed to deter our red light camera, however, and it's easy to spot, tempering our enthusiasm for this plate cover as an antidote to photo-enforcement cameras.